The day before I flew out of Australia the Solar-powered airplane landed in Hawaii after a record-breaking 5 day flight from Japan. When I heard this news I knew that I wanted to see this plane while I was in Hawaii. My flight from Brisbane left in the evening of July 4th and I arrived in Hawaii in the morning of July 4th. 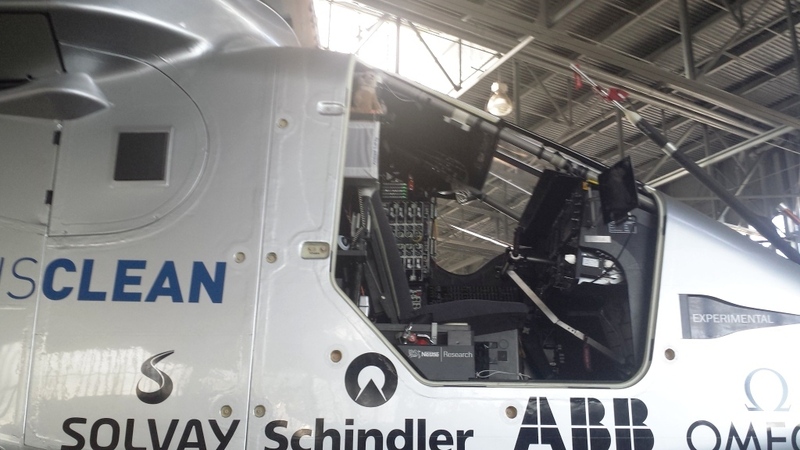 The plane, piloted by Andre Borschberg, is attempting to fly around the world without fuel. Instead, its wings are equipped with 17,000 solar cells that power propellers and charge batteries. The plane runs on stored energy at night. When my friends met me at Honolulu airport I asked them if they would be interested to see the Solar Impulse. Of course they would. Doug is a pilot with the cival air patrol in Hawaii and knew exactly where this plane was while it is in Hawaii. Early the following morning we left the house to see the plane. July 5th was the first day it was being open to the public. We arrived before 9am when the display was to open. We were so surprised to see that there were already about 1000 people lined up waiting for it to open. So, we joined the line. We did not need to wait long. The authorities let in about 100 people at a time. So we were in and back out again in about 45 minutes with plenty of time in the hangar to enjoy the entire presentation. The display was so much more than we expected. There was music, posters, banners, presentations and THE PLANE. It was so well done. Such an amazing wonderful achievement. An aviation historic first and a historic first for energy and cleantechs. Well written! The plane is amazing and just a little over 5000 pounds in weight. You must feel excited at seeing a first, Great start to your holiday adventure. Wow, great experience Lyn, so close! :) Have a nice time! So interesting Lyn – thanks for telling us about the day. Sounds amazing. It was a very special and unique opportunity which I felt very lucky to experience.